For the sixth year in a row CUAA has broken a total enrollment record, with 1,197 students registered for undergraduate, graduate, and online programs through CUAA, as of the fall 2018 official census. The total represents an 11 percent increase over last year and a 60 percent increase in overall enrollment since fall 2013, the year the institution merged with Concordia University Wisconsin. 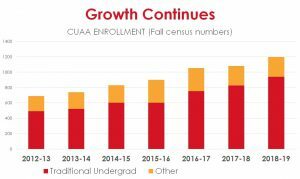 This year’s incoming class total at CUAA also continues the campus’ celebrated enrollment trend. This fall, CUAA welcomed 333 new traditional undergraduate and transfer students, a 25-person increase from fall 2017 and an increase of 117 new students compared to the fall 2013 student count. An equally important gauge of an institution’s overall health, Concordia’s retention rate jumped nearly 10 percentage points from last fall. University leaders say efforts to improve students’ financial literacy and enhance communications surrounding the topic are largely to thank for the retention boost. Students have been drawn to CUAA in recent years thanks a growing number of new program offerings, an acquisition of a new academic space, and substantial upgrades to campus facilities. Among the modifications implemented last year, Concordia rolled out a new athletic roster financial alert system that made it possible for coaching staff to give early notification to team members about unresolved registration, billing, and financial aid issues. Since the merge, the university has designated millions of dollars for projects on the Ann Arbor campus, including renovation of the Kreft Center for the Arts, construction of a new football stadium, and the purchase of the 84,500-square-foot North Building to house the campus’ new School of Nursing and athletic training program. Later this month, Concordia will dedicate a new competition-grade track and turf field, and renovations are currently underway for the campus’ physician assistant studies (PA) program, which is scheduled to launch next fall. 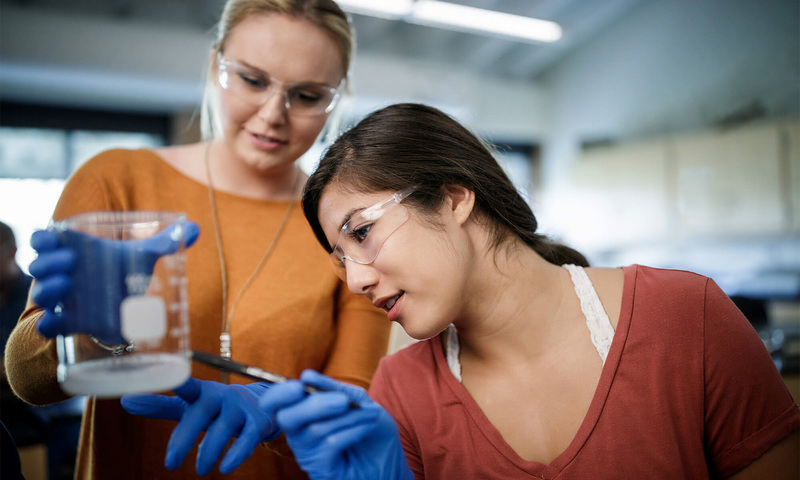 In addition to Concordia’s PA program, the campus has added multiple new degree programs within the past five years, including social work, computer science, special education, nursing, and athletic training, as well as a graduate-level program in student personnel administration in higher education. The campus has also added new athletics teams to its roster, bringing the total number of championship-level athletics to 24. The additions since 2013 include men’s and women’s tennis, men’s and women’s lacrosse, and, started just this season, men’s and women’s hockey. As enrollment momentum continues, Concordia has persisted in seeking out ways to make a high-value Christian university experience accessible to even more students. In fall 2016, the university announced the Luther Promise scholarship which guarantees up to $20,000 for traditional undergraduates who are members of a Lutheran congregation, graduates of a Lutheran high school, dependents of a rostered LCMS church-worker, or children of a Concordia University System alumnus. This year, the university also announced the first-ever scholarship for CUAA alumni. Concordia graduates who are looking to continue their education and enroll in one of CUW or CUAA’s qualifying post-traditional or adult accelerated programs are eligible for a scholarship.